There are some new advances in trucking technology that may soon become common for transportation companies. The goal is to make operations simpler, more efficient and safer. These are all important factors when it comes to choosing a trucking company to meet your shipping needs. Here are just a few of the trucking technology developments we can expect to see in the near future. There’s no denying that in collisions with a big rig, a passenger automobile is at far greater risk. Despite the headlines and public perception, some studies indicate that fewer than 9 percent of highway deaths involve commercial vehicles. New technologies are designed to reduce those statistics. Active breaking systems (ABS), collision warning and electronic stability control are becoming standards for new trucks. These three systems are engineered to work together in each vehicle to reduce crashes. The driver is still absolutely in control and responsible for safe operation, but these new technologies assist truck drivers when bad circumstances develop. Perfection of the technology is still years away, but experts say driverless vehicles will eventually come to the trucking industry. In most of the early trials being done, the technology is working. The idea may cause many drivers to worry about their job security, but it’s more likely that we’ll see the technology take hold slowly over the coming years. Fully autonomous vehicles may have limited driving time or fixed local routes. They might be fully capable of staying on a straight highway while the driver naps. All of these trucks will have 360-degree camera and sensor views, driver displays on vehicle performance and logs and instant alerts for the driver. GPS does far more now than provide navigational directions. These units provide a number of features to become an increasingly popular addition to trucking technology. Many modern GPS devices can give warnings on speed limits, steep grades, low bridges, weigh stations and truck stop locations. They can also monitor vehicle speed and fuel usage, play audiobooks and music, respond to voice command and connect with smartphones to use and display additional apps. This involves creating vehicle-to-vehicle automated communication systems so that trucks can stay in sync, a sort of virtual platoon. Fleets can be more easily organized into efficient “trains” of vehicles one behind another for better service. This helps to provide fuel economy through reduction of air drag, and thus reduces fuel usage and emissions. Braking and anti-collision systems also improve safety. Computer chips and Wi-Fi technology allow trucks to travel at fixed distances from one another. While most platoon trucking today consists of two or three vehicles, we may be seeing longer platoons where routes overlap or rival companies coordinate resources. 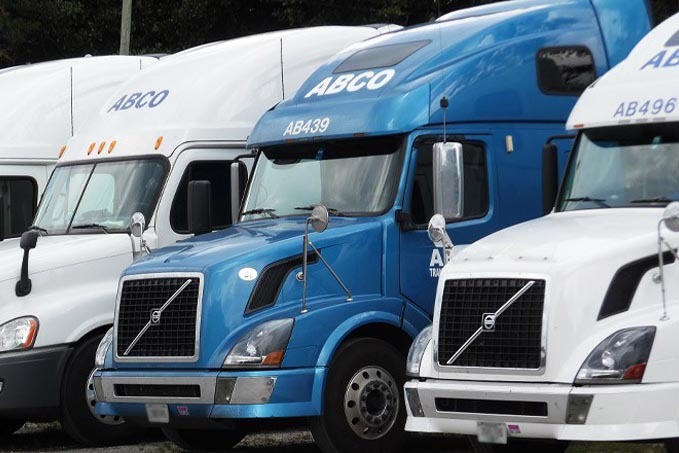 ABCO Transportation is an expert in the trucking industry. No matter what changes come along, we’re committed to maintaining a high level of expertise and reliable delivery on every load. We specialize in refrigerated trucking. Contact us today and find out how we can get your perishables there on time.